BMW X5 and X6 get sporty | What Car? BMW has confirmed it will produce sporty variants of the X5 and X6, as well as giving its current 'M' range a mild makeover in 2009. The cars will be called the X5M and X6M and will be powered by BMW's twin turbocharged 4.0-litre V8 petrol engine, launched in the standard X6 earlier this year. Sales in the UK are not expected to start until next year. Meanwhile, the M3 will get a slightly revised interior with active front head restraints to reduce whiplash in an impact, plus new air vents and a fresh front armrest. New options will include a seven-speed dual-clutch semi-automatic gearbox. M5 and M6 models gain a new version of the iDrive central control system, and a new sat-nav set-up that integrates with the phone system and an 80MB music player. The M6 Coupe will come with the option of a Competition Package that features even lower suspension, double-spoke aluminium wheels and a different bonnet with more pronounced curves. UK prices for the revised M ranges and new options have not yet been announced. 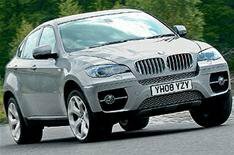 UK sales of the X5 M and X6 M aren't expected to start until spring 2009.